Yesterday, a young activist was jailed for peacefully protesting against crimes committed by her own government. If you’re trying to figure out why you can’t remember seeing anything about this on the evening news, you’re wasting your time. Maya Evans is not an Iranian, Russian or Zimbabwean dissident, but a British young woman protesting against British official policies. You won’t be hearing about her story because, as far as most of the media is concerned, there is no story. Maya was jailed for 13 days for her principled refusal to pay £300 in fines and costs incurred after a court case in November 2009. She was arrested in May that year for taking part in a nonviolent “die-in for NATO’s victims in Afghanistan” outside Britain’s military base at Northwood, an action held to mark the second anniversary of a NATO bombing attack, on 27 May 2007, that killed 47 Afghan civilians. The protesters had demanded an end to the bombing (which continues to date) and the withdrawal of British troops from the country. For this act of symbolic protest, Maya was convicted of, wait for it, “obstructing the highway”. Her very presence was deemed illegal. How a prosecutor managed to conduct the entire case whilst maintaining a straight face we shall probably never know. Everyone remembers the iconic photo, from the Tienanmen square protests in 1989, of one brave Chinese man standing defiantly – shopping bag in hand – thus blocking the path of a file of Army Tanks, and preventing them from advancing. He, too, was “obstructing the highway” yet had the Chinese authorities attempted to charge him with such an offence, one can only guess the effects on the earth’s geological structure of the entire planet erupting into a synchronised howl of disbelieving laughter. Instead, here in Britain, in 2012, a young woman is sent to prison for “obstructing the highway”. With hardly a peep from the media. This is not the first time Maya’s activism has unnerved our notoriously thin-skinned establishment. In 2005, she was convicted for reading the names of the Iraq war dead opposite the Cenotaph … without police permission, thus becoming the first person in the UK to be convicted under the Serious Organised Crime and Police Act (2005) for taking part in an “unauthorised demonstration within 1 km of Parliament Square”. You read that right: it is a crime to read a list of names without the say so of the police. Again, had this happened in Caracas or Havana, British politicians and journalists would have had a field day, loudly proclaiming their mystification as to how the Venezuelan or Cuban justice systems had failed to collapse under the weight of their own ridiculousness. In Maya’s case, they merely shrugged and moved along. 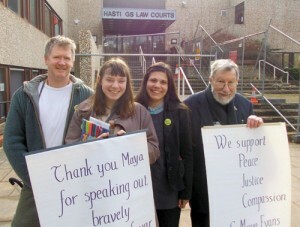 In 2010, Maya won “a partial victory” in the High Court, regarding British complicity in the torture of Afghan detainees. She recently returned from a month-long visit to Afghanistan where she worked with Afghan peace activists. During her time there, she also met with refugees and human rights workers. How is it that we criminalise not the killing of Afghan civilians but the denunciations of such killings? How can we seriously lecture others on the merits of free speech and democratic openness when a young activist is deemed so threatening to the official narrative that she must be made an example of? Her peaceful act of protest considered so subversive that it cannot be allowed to go unpunished? How can a justice system worthy of the name consider her prosecution and jailing a justified use of taxpayers’ money yet have nothing to say (or see) about those who sent a nation to war based on dodgy dossiers and bare-faced mendacities; at a cost, still rising, of thousands of Iraqi, Afghan and British lives? Maya’s persecution is immoral, stupid and shameful, but it would be a mistake to think of it as an isolated instance of no wider consequence. The post-9/11 decade has witnessed a full-on assault on our civil liberties, notably our right to hold power to account through public protest and speech. Slowly, layer by layer, freedoms that had been taken for granted for centuries are stripped away from us. What was legal yesterday needs a permit today and will be a crime tomorrow. As we have seen in the eviction of Occupy LSX on Tuesday night, it’s a very steep slope and many are starting to realise we have sleepwalked ourselves into a reality where young men and women praying peacefully on the steps of St Paul’s are violently shoved and pushed and manhandled because the “law” said so. Those who airily and routinely dismiss this drift as, at worst, a “necessary evil” should beware: they might find themselves at the very sharp end of it before long. A country that jails its Maya Evans is a country that urgently, desperately, needs reminding that while freedom is always bought dearly it is, all-too-often, cheaply surrendered through ignorance, cowardice and silence. In 2006, Maya’s book Naming the Dead, was published by JNV, to get a copy, click here. More leftie claptrap. This sad woman was given a very short cjustodial sentence for refusing to pay her fine.She was fined for holding an unauthorised public demonstration within 1km of Parliament Square. Try and tell the truth for a change. Funny how this person manages to spend so much time on these cheap publicity stunts and daft antics – I wonder if we’re paying for her with benefits? She didn”t think what she did was wrong. Neither do paedophiles. I’m guessing you’re an avid DailyMail reader? It is always curious how right wing bigots (TruthVersusTheLie – as if this person can even tell the difference between those two words) use ideology and pointless statements like “neither do paedophiles” why you may ask? – These people do not want intelligent debate, they supply obfuscation because they don’t want ordinary people to have freedom and want to terminate the right to protest against war crimes committed by a Government which tries to tell other countries about humanity and freedom. The fact is more civilians die than soldiers and yet it is the people who go into battle and kill innocent people that we remember. Soldiers are not brave – innocent civilians and citizens like Maya are trying to show us that these wars are not even wars – they are genocide. The fine Maya was charged with was “obstructing the highway”, when her actual intention was to protest against a Government that is not even properly elected. Her intention was not to obstruct a highway. It seems such decisions show the UK legal system cannot be argued to be serving justice if it seeks to fine and arrest citizens who simply want to alert us to the UK Government’s international war crime record.